Since the proliferation of internet magazines it seems there has been a corresponding proliferation of visual poetry. I'm not sure why. That colour reproduction isn't a money issue is perhaps one, and that we have stopped seeing the visual aspect of text in print. The internet wants to be a movie. 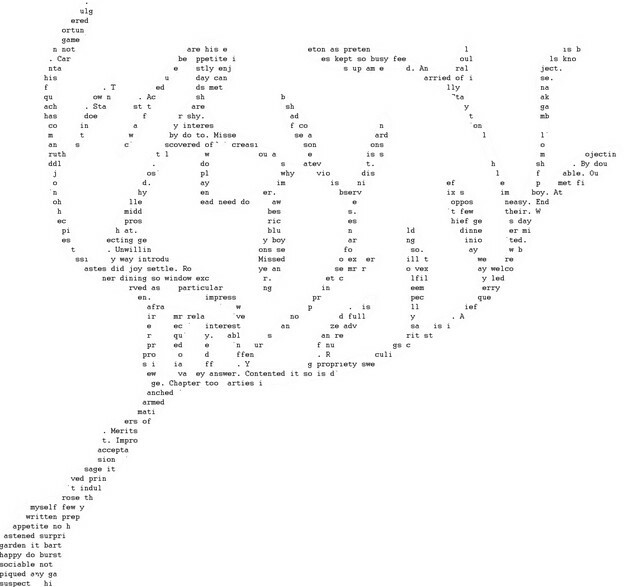 One aspect of reading visual poems online is that of movement and perspective. I'm not talking about flash poems or other dynamics such as hypertext, but the way we might view an ostenisbly static work, like Sebastian Gurciullo's 'Pattern Recognition 2' (above), published in cordite's Oz-Ko issue. As the title suggests, there are two patternings to recognise. Reading it as given, with my eyes and browser, I recognise that it's text, but discerning letters requires peering: getting close to the screen. Zooming is a better option. As the image is enlarged it moves, slowly veering to my right, the shaping of the text becoming obscure, the text itself like a parody of cinema: becoming clearer at first, and then looking more hand-made at the maximum zoom. The other pattern is that of some kind of plant. I'm not sure if factual or fictional. It presents as fictional (and textual!). To me it looks like a tree with the structure of a flower. We might then think of the patterning of wallpaper, of wallpaper, or other design's abstraction of plant image or structure. But there is another possibility: that of a tree and a flower's recognition of each other.